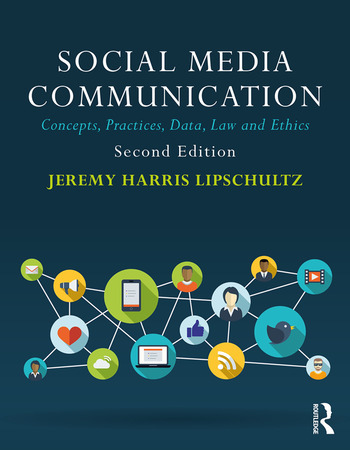 In the second edition of Social Media Communication: Concepts, Practices, Data, Law and Ethics, Jeremy Harris Lipschultz presents a wide-scale, interdisciplinary analysis and guide to social media. Examining platforms such as Facebook, Instagram, Snapchat, LinkedIn, YouTube and Pinterest, this book explores and analyzes journalism, broadcasting, public relations, advertising and marketing. Lipschultz focuses on key concepts, best practices, data analyses, law and ethics—all promoting the critical thinking professionals and students need to use new networking tools effectively and to navigate social and mobile media spaces. Featuring historical markers and contemporary case studies, essays from some of the industry’s leading social media innovators and a comprehensive glossary, this practical, multipurpose textbook gives readers the resources they’ll need to both evaluate and utilize current and future forms of social media. For more information about the book, supplementary updates and teaching materials, follow the Social Media Communication Facebook page, @JeremyHL on Twitter and the UNO Social Media Lab on SlideShare. Jeremy Harris Lipschultz is Isaacson Professor in the UNO Social Media Lab, and School of Communication, University of Nebraska at Omaha. He is a blogger for The Huffington Post, Linkedin Pulse and ChicagoNow, and has authored or co-authored six previous books and dozens of articles. Lipschultz is an international media source and frequently speaks on industry and social trends.